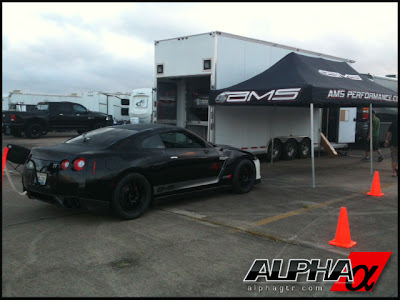 AMS is back at it again, this time at the Texas Mile. They managed a fastest speed for Nissan GT-R's with their 1600 whp Alpha Omega with 233.1 mph. 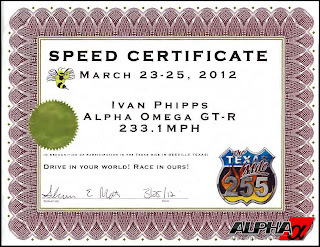 This makes this car, both the quickest in the quarter mile, and fastest Nissan GT-R in the mile, with the fastest top speed time recorded for an R35 GT-R.
29.5 peak boost, 8400 rpm through the traps! He was not out of gear but rather out of aero. He said he could of spun it to 8900 but the car was just too much of handful with stock aero. Nice going AMS, whens it headed to Buttonwillow 13CW for some Time Attack? Stay tuned for some more pictures, videos, and information on the AMS Alpha Omega GT-R.